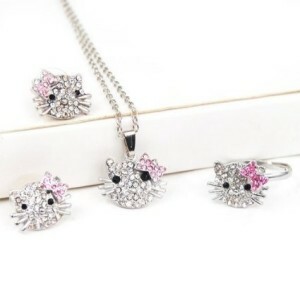 Hello Kitty Crystal Jewelry Set Just $2.59 SHIPPED! You are here: Home / Great Deals / Amazon Deals / Hello Kitty Crystal Jewelry Set Just $2.59 SHIPPED! Attention Hello Kitty fans!! Here’s a deal for you! Get the Hello Kitty with Pink Bow Crystal Jewelry Set for just $2.59 SHIPPED on Amazon! Set includes a necklace, earrings, and a ring.